Thanks everyone for letting me share my new projects in Stitch Spring 2013. I'm going to do a little give-away : ). I'm giving away a Spring 2013 issue of Stitch magazine and a lovely Springy bundle of fabrics from Sew Me a Song! Beca from Sew me A Song is donating these lovely fabrics. Aren't they just scrumptious?! Perfect for the Pomme Potholders or any of your Spring sewing projects! Leave a comment on this post telling me if you have any plans for Spring sewing projects. I will pick a winner Wed, Feb 13th. Good Luck! I would love to do some new livingroom curtains in the Spring - these heavy drapes are just a bore - can't wait to lighten up! I'm going to make a picnic quilt in the hope that we get a summer here in the UK this year!! I've got really huge plans for Spring (and for 2013): I would like to use someone else pattern and sew a quilt. That's really challenging for me, because usually I alternate patterns or come up with my own. I hope to make a new picnic quilt...maybe using my Jelly Roll of Lucy's Crab Shack, I think that line is perfect for outdoor picnics on a summers evening! My spring projects will be tablerunners for friends and family. Thanks for the chance for a very generous giveaway! What a fab giveaway! Not sure if it's open internationally, but I would love to win as Stitch is impossible to get here! My spring sewing goal is to make a large scrappy quilt as I need to clear out some of the scraps in my sewing room, it's getting crazy in there!!! I saw a really cute bunny made by someone who did the Dare to Dresden blog hop and I would love to try to duplicate it for a pillow for Easter. Thanks for the chance. My main spring sewing goal is to learn how to use my serger and make some cute dresses for my little girl. Your bag is darling! I need to make something for my best friend who has a birthday in May. We always try and make something homeade for each other....maybe your bag would be a good choice and include an umbrella. Thanks for the inspiration and the giveaway! I'm really excited about all the babies coming this spring/summer and the cute baby sewing I get to do! Hi Charise. I just found your cute blog. Those fabrics are so cute, not to mention the adorable bag on the cover. With my family living back in town now I finally get to spend time sewing with my granddaughter and this will be the first year we've done it. I'm looking forward to making her & helping her make some really cute tops and dresses. This sure would be a BIG help. Thanks for letting me enter your generous giveaway. Yes some Spring sewing will be happening soon indeed! I have two friends who are expecting babies so I will be making some bibs and wash cloths soon! I can hardly wait for Spring! I could use some bright fun fabrics to start a new table runner and placemats. Thanks for the giveaway. Oh fab giveaway!! I want to get that magazine but I can't find it in the UK! Tenho que fazer algumas fronhas e capas para almofadas para minha filha que se casa este ano.Amei sua sacola.Obrigada. Arrgh, I've brainstormed too many quilts for this spring! Unfortunately they are all intended to be gifts, so I think I'll have to create an actual sewing schedule for myself...Wish me luck, and can't wait to see the latest Stitch! There are so many things I want to sew ~ I need a new quilt for my bed and pillows for the couch and then there's just fun sewing ~ zip bags and I really need a new spring bag! Thanks for the giveaway ~ loving that fabric bundle! Eeek! I'm not ready for Spring yet! My current goal is to finish reorganizing my sewing studio before spring arrives, since we started tearing it apart and reworking it at the beginning of the year. Then I have the Dresden plate quilt to finish up in time for my niece's 5th birthday (March 10th). After that, there's a Storm at Sea quilt waiting to be cut out and started. Oh wow!!! I'd love either of these!! Pa-lease! I have lots on my to do list for spring- mainly a Tova top for me and some kids clothes (gotta learn that new serger)!! i have so many things i need to get done right now that i can't really think too far ahead to spring. i'd like to make an x & + quilt at some point though. I have so many projects going right now and into the spring and summer. A another baby quilt and my nieces wedding quilt are just 2 of them. Thanks! So neat that you made the cover . I will be working on UFOs and a small wall quilt as well as charity quilts for my guild. I look forward to warmer weather! All your projects you have been showing from the magazines are wonderful! I plan on making a lightweight voile quilt. I think I'm going to be making some aprons! My daughter is expecting again. Will be making more baby things. I am trying to get a quilt out of the frame that I am hand quilt. I want it out WAY before spring! Thank you for sharing such a lovely giveaway. I am spending a few weeks making cuddly toys as a fundraiser for the youth in our church. so far I have made 15 bean bag frogs, now I am about to cut out a pile of owls, then hopefully some elephants. Is there ever! lol.. I am planning on making a buckeye beauty quilt and a paris flea market baby quilt. Also making some new place mats for the dining room table. Oh and I would love to make those slippers of yours ;) they are just fabulous! I'd like to brighten up my kitchen for spring with a cover for my mixer, toaster and perhaps an apron as well. lovely giveaway..I am hoping to make a picnic quilt..my daughter loves having picnics so a nice quilt to take along would be great. After seeing those cute little slippers, I got a copy of the magazine, so I could make them! Love the mug rug as well. They are on my list! I really need to make some pillows, so that is on my Spring agenda. Oh pick me! I want to try a few of the projects that you have featured from the magazine. I just love the little umbrella tote, and that skirt you showed looked interesting too. Pick me Pick me Pick me... I have a friend who just found out they are having a baby girl, their first.. I think these would make an awesome over the top baby quilt!! I'm definitely doing some Spring sewing!!! Fingers crossed the Stitch magazine arrives today....I phoned Chapters yesterday...and then actually went and checked the store later in the day when I was passing by...can't wait to make the slippers, purse (with the cute little umbrella pocket - gasp!!!) and the little apple trivet! Thanks for the awesome give a way! i have a few projects this spring...i am doing an exchange with an artist friend of mine...he gets a semi-custom quilt from me and i will be getting semi-custom art from him. :) i say "semi-custom", because while we will be giving each ideas of what we like, these projects will be completely dependent on what we have on hand! i also will be making placemats and a tablerunner for my sister, who has just gotten a new apartment. and i have a couple of beautiful nieces who need new bedroom curtains. I was thrilled to make some Valentines placemats, it was a first pick me up for my kitchen, but when Valentines is over my kitchen will be back to boring. It certainly will need something spring and cheery to keep it in that happy space. Right now I am making myself a new purse. It is in dark red fabrics not as springy as those gorgeous fabrics you are giving away. Thanks to you and Becca for the chance at this wonderful giveaway, Charise! I want to make one of your pomme potholders soon! I'm planning to make all of your patterns. I just love them all, but especially the vintage sewing machine! Not really spring sewing (as I look out onto a huge winter storm) but I am going to try and make my first quilt pattern! I've been mom recently (December 21st) so I'm planning to make some clothes for my little girl and these bundle will be perfect!! I'm looking forward to some springy runners and placemats! HI! I'VE DECIDED WE DO NOT HAVE A VALENTINE WALL HANGING,SO I'LL BE STARTING ONE! I have 3 pregnant friends, so I have alot of baby sewing. thanks for the chance! I gave up on New Year resolutions a while ago and decided to have "Learn Something New This Year" goals instead. This year I am improving my sewing skills and learning to piece and machine quilt. My daughter has decided to join me this year and is learning to sew properly. We are spending bonding time making a sampler quilt together. I am so glad I stumbled upon your blog and tutorials. Definitely gives me some ideas and inspiration to sew my way out of Winter and into a floral fabric Spring! I am going to finish a king size quilt for our master bedroom! Charise, what a delicious giveaway! I've loved seeing your projects from Stitch and can't wait to get my hands on a copy if I.
I plan to sew up a new bag. Love these fabrics, especially the top one! Thanks for the giveaway! I hope to finish some ufo's but after seeing your bag I may be tempted to try one for me! Would like to finish up on a quilt I am making for my son and his bride to be, for their wedding gift. Also have a baby quilt to make for a new grand baby due in June. Love your giveaway fabrics! I'm thinking spring/ summer clothes for my five year old granddaughter, Emily. In fact, I bought two patterns today. Thanks for a super giveaway! I am addicted to my sewing machine. Wish I could cut properly though as well as reading destructions (instructions)! Right now I'm making a long overdue quilt for our youngest granddaughter. I am doing as many sew/quilt-alongs as I can! I love Sew Me A Song...I placed an order 2 weeks ago and it arrived almost as soon as I hit enter! Great service and beautiful fabric! thanks for the giveaway. I'm in middle of sewing a quilt for my daughter that graduates this Spring from High School. top is completed. need to purchase the backing now. oh Charise those fabrics are lovely!! I really want to start "a bee in my bonnet" row-along by Lori Holt. I've been watching the flickr group and they are all turning out so cute. Thanks for the chance to win and Congrats on all the new projects! My 80 year "young" mom was here today and she fell in love with your slipper from the magazine, so she took my copy of it. I wouldn't be too surprised to find out she has those made already.. so I have to wait for her to get done with my magazine before I can start making my projects from it. But being able to share sewing projects with my mom makes me so very happy... thank you..
Oh, these luscious berry prints make my mouth water! They also remind me that Spring is around the corner (It has been a long, long, cold, freezing winter here in UT) Anyway, I would make a lovely patchwork tablerunner for my table to enjoy thru the summer. Yummy Yummy fabrics! The recipient to this fabric bundle of joy, will be very lucky indeed! :) Thank you for the opportunity. I have no plans for sewing. Kind of wish I did! LOL! I just sewed two pillowcases for SewExpo's pillowcase patrol which will go to the Mary Bridge's Children's Hospital. I am taking a hands-on class at SewExpo to make a computer case which I don't need but the class promises to teach how to sew zippers with your serger! I need to bring some general sewing supplies to the class but all the sergers are provided. I can't bring my scissors, threads & needles in a ziploc so I need to sew something to carry them in and look stylish - like I sew! I am thinking something with Pendleton Plaid - they might have a giveaway at their SewExpo booth again this year if you bring something sewn with Pendleton. Cannot wait until March 1 (Sewexpo is Feb 28 - March 3 in Puyallup). Thanks for the giveaway. Congrats on having your projects featured in the magazine. I don't really have anything specific lined up. I am going to be the speaker at a mother daughter luncheon in May in the Bahamas on a very small island. I would love to make some little keepsake to give to everyone that attends. It will have to be something small. Thank you so much Charise for a chance at the give-away. I'm trying hard to find this magazine in my area (Canada) so it would be awesome to win it! Hmmmm, spring sewing?....no particular plan/design but I sure am itching to work with some springy fabrics. I need to go stash diving to find the right pattern. that it is true! Thanks for the chance to win! I'm planning to make a quilt for my great niece, and continue to finish at least one quilt a month from my stack of unfinished tops. Thanks for the chance to win. I am hoping to start my own quilt, which will be made with Sweetwater's Sunkissed. Yummy spring colors. I have so many sewing plans in my head, I really need to make a list. I have bags to make and bee blocks, a charity quilt and a wedding quilt. Argh, I should be sewing instead of reading blogs. Thanks for a chance to win these great fabrics. My Spring sewing plans include making drapery panels for my patio window. First baby girl in a family of boys has arrived, it will be springtime all year. As they live so far away the pretty things I sew will be my way of feeling close to her. Your fresh designs fun and challenging for me and are sure to be a hit. I'm not waiting, I'm starting today! Thanks for the inspiration. I'm deciding on an Easter project. Congrats on all the Stitched spreads and cover! We have at least one new baby coming into the family, so definitely something for him/her. And I must have at least one new tote for the spring. I don't have any specific plans for spring sewing - just the usual: baby quilts, assorted BOMs, new table topper (or two). Would love to win that fabric! Can't wait to read the magazine! After a big snowfall here, I'd like to "Think Spring." This April, my husband and I will be taking a trip to Italy and I need a hand project to carry with me. My dining room table needs a new table runner to welcome in the Sring. Your fabric choice sure does fill that bill. Good luck to us all. This spring I'm hoping my sewing skills have progressed enough that I can make my daughter some sundresses for the summer. I always love planning spring projects....the colors make me happy! I'll be working on a Crabapple Hill quilt (who doesn't love their patterns!) for a dear friend I've known forever. Buttery yellows, reds, and pinks on a white background with embroidered embellishments. Beautiful fabrics and I would love to win the magazine Charise! I will definitely be making new table runner, bags and other things this Spring! Congrats on the magazine cover! How cool to see your hard work front and center! My Spring plans are to continue my BOM's (4 of them, I have quilting ADD Lol) and I'd love to make a Spring quilt with all of your other patterns! 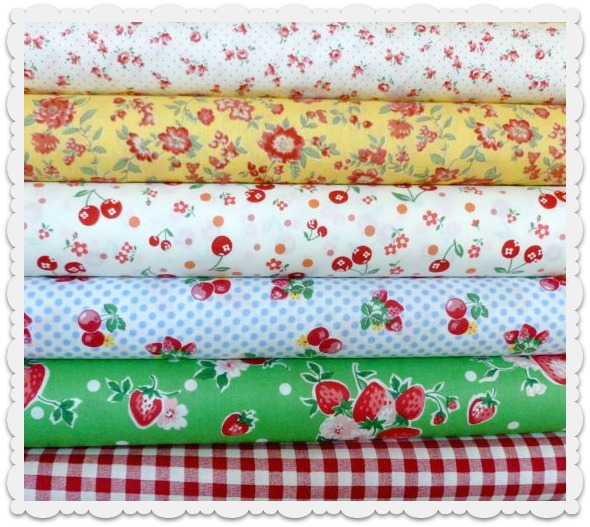 I've ordered fabric from Sew Me A Song recently and even looked at this bundle! Thanks for the chance to win it! Yummy fabrics. I have many plans for spring, but the most important are place mates for my special friend. Hope to have them ready for Easter. this spring and summer i am hoping to catch up with my bee in my bonnet row along. i am quite a bit behind, but our spring/summers are very long here in mesa, arizona, so i think i can do it. also, i have fabrics picked for the vintage block quilt along - i love your patterns. thank you for sharing! My spring project is a lil twister cross by Martha D-zines. Got almost all teh squares sewn adn then will cut and resew:) what fun!!! Congratulations Cherise! Love your patterns! My spring project will be a Scrappy Trip Along quilt...can't wait to get started! Thanks for the chance to win such pretty fabric! Spring (!) sewing will include making new purses and small items for the coming Christmas season. Ha, maybe I will actually get it done this year! I am thinking about making a new valance for my craftroom windows. I would also like to make a spring colored scrappy trip around the world for a table cloth. If I could just figure out the pressing directions for the rows...I can't really tell how people are pressing them. I would love to make some of those apple potholders for springtime gifts! I do have plans for some place mats, zippered bags and pillowcases. Thank you for the chance to win! Nothing planned, but I am not much of a planner :) I made your slippers from the new Stitch just this week--bought it on Monday, along with the non-slip sole fabric, and finished them up today. This spring I am going to make a purse for my mom for Mother's day. I'm also going to try my hand at some dining room curtains! And, as always, try to bust through some UFOs!!!!!! My main spring sewing goal is to make some little dresses for my new granddaughter. I am planning to sew up some baby quilts for a charity using some of my test blocks in the coming weeks! Tengo que coser bolsa mensajero para mi hija que comienza las clases a fines de febrero.Una túnica para mi otra hija . I'm hoping to make a Hina Matsuri Girls Day table topper soon! I need to make a whole bunch of gifts for new babies by Spring, so that's number one on my list. I'd also love to make some more pillows and table runners, since they are my favorite projects! I have plans for so many sewing projects for this spring, I'm not exactly sure where I'm going to find the time to get it all finished! Currently, I'm cutting out a divided fabric basket pattern to make a gift for my SIL and bro for their first baby that is due to arrive in March. My spring sewing plans include table runners, placemats and pot holders to make for the coming christmas. My spring sewing is including 2 baby quilts for babies being born in March! My second granddaughter and my first great grandbaby (also a girl)! I'm so excited! I have a quilt for my nephew's wedding and for my mom's 75 birthday to do this spring! I have too many projects in mind (my daughter is expecting her first baby)! A baby quilt, most definitely. Bibs, booties, etc. I am a new quilter and have plans to make my first tablerunner for Easter. I hope to have enough scraps to make some mug rugs also. Thank you for the chance to win this beautiful fabric! Just found your blog, really enjoying it. Hola: no se si estoy a tiempo. Mi proyecto es un bolso con la técnica del Jardín del abuela y en el centro un logcabin, con motivos de patchwork. Este bolso me servirá para llevar mis labores, a las tardes soleadas, al parque de aquí. Estoy en Jerez de la Frontera. (Cádiz) (España). Suerte para todas las demás. These fabrics make me want to go on a picnic, and making new table toppers for our patio table is definitely in the plan for spring.